You can now try out five new ways to read this site. 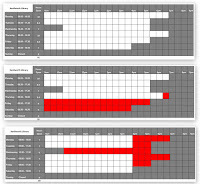 Timeslide, Snapshot, Sidebar, Mosaic and Flipcard. 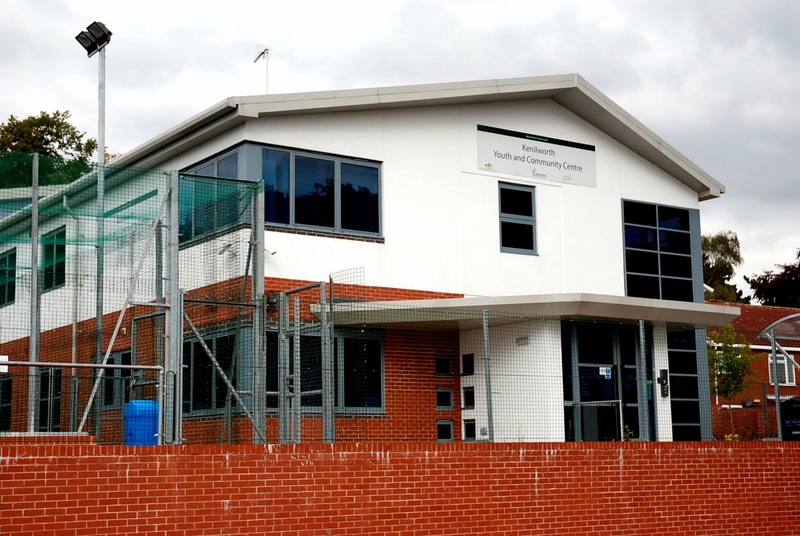 The announced cuts in the Warwickshire County Council Youth Service could lead to Kenilworth's Youth and Community Centre being closed. The current management committee believe that this would be a tremendous loss for the whole Kenilworth community, especially its young people and users of the centre like the Spring Playgroup. We are not prepared to stand by and see that happen. So the committee is preparing to bid to take over the centre from the council in order to maintain youth services, and the activities in the centre. The committee will be establishing a charity which aims to be running the centre by the autumn, subject to agreement with Warwickshire County Council, and being able to develop a sustainable plan. The new charity, with the working name of The Kenilworth Centre, will work closely with other local organisations, and the Kenilworth people, to maintain youth services and ensure the centre continues to be used for the benefit of all. For the 6 June 2011 at BBC Coventry: BBC Coventry and warwickshire, public sector, hyperlocal and social media – an evening. For the 31 March 2011 at BBC Birmingham, read on..
JobHits is a real-time job search engine, which searches from other job boards and company websites which includes JCP site at: http://jobseekers.direct.gov.uk. 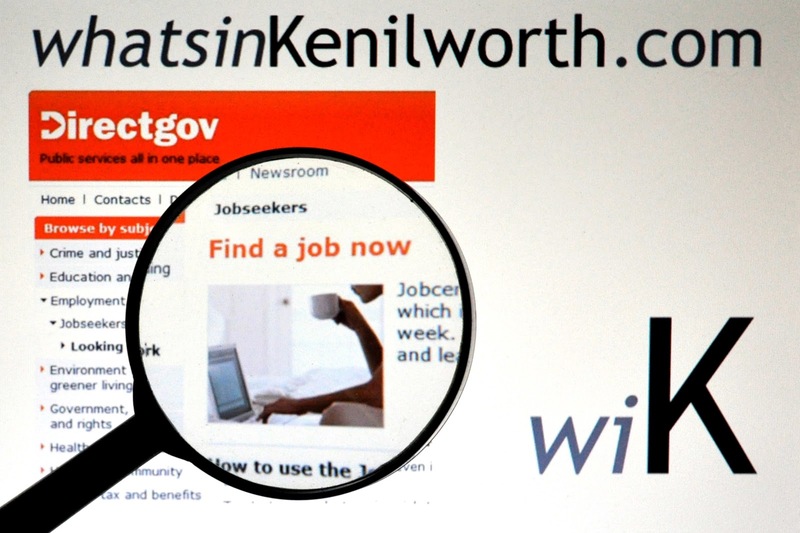 JobHits is a search engine, like Google, but only for jobs.You can find all jobs at JCP jobs listed in our site at this link: http://jobhits.co.uk/jobs/k-jobcentre-plus.html. 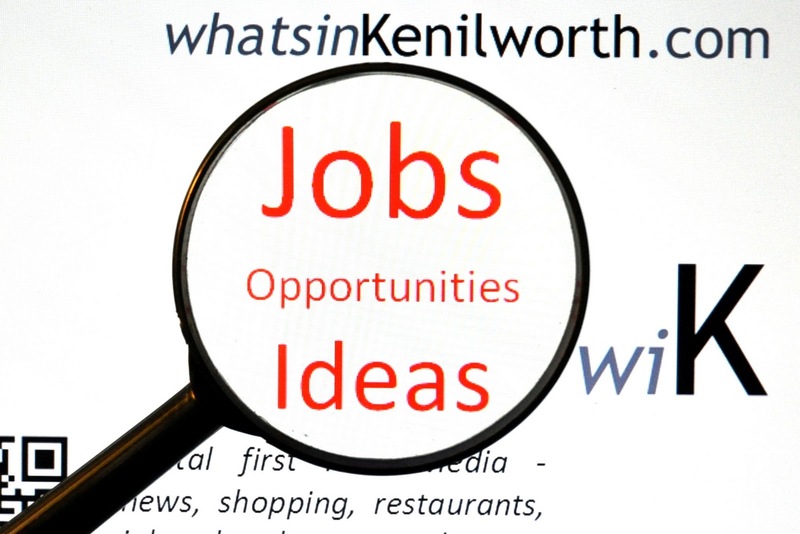 Everyday JobHits adds about 6,000-10,000 new jobs from JCP website. whatisinKenilworth.com has a Google Place Page which has received 10,790 visits in the last 30 days - that's 360 a day. Every time someone types Job Centre into Google in the Kenilworth area whatsinKenilworth is dislpayed. There is no doubt, this site has been reporting the impending cuts in the Youth Service, Libraries and Police in the last month. But, it's vital that we exploit whatever prospects the region has to offer from now on. WCC launched a series of Meeting and Roadshows two days ago to spread the word about the consultation process. There are five pages listing the dates: Stratford, North, Nuneaton and Bedworth, Rugby and Warwick District (pdfs at base of page). Each library has about one Public Meeting and a Roadshow drop-in session. But wait, the dates were launched on Wednesday and that gave Warwick only a few hours notice. And look at Lillington having their meeting on the very evening that the consultation ends ( 9 June 2011). Kenilworth Library may close by 16 hours - how would you choose? There are 77 days left before the Warwickshire Libraries consultation closes on 9 June 2011. 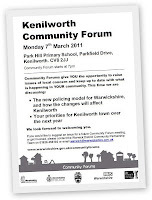 A drop in Roadshow is being held at Kenilworth Library on Thursday 5 May 2011 between 3.30-6.30pm and a public meeting is planned on Monday 6 June 2011 at 7pm at Kenilworth School. Do not even ask me why this meeting is scheduled three days before the consultation ends? 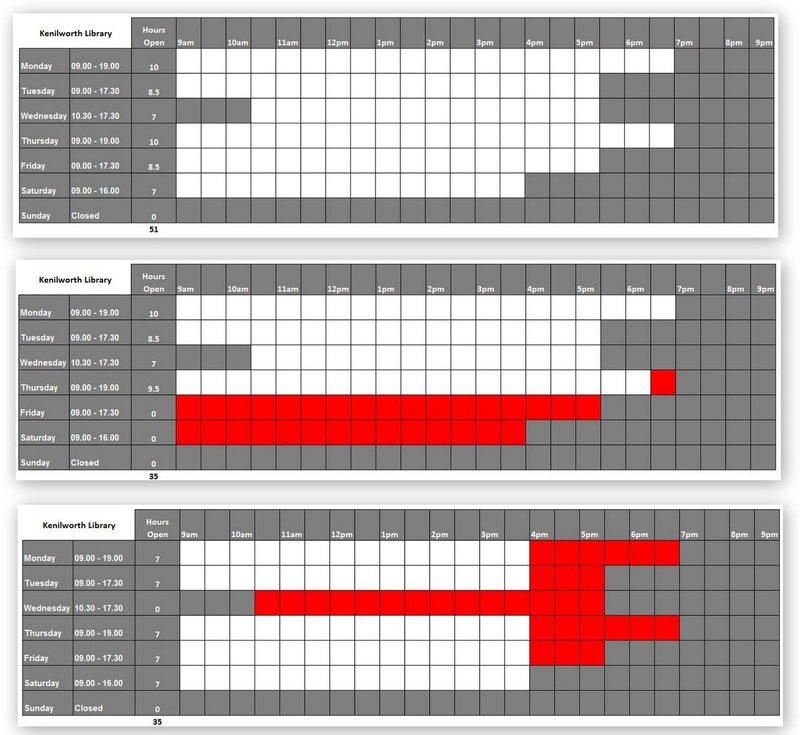 Here are three timetables showing Kenilworth Library opening 51 hours (as it is now) and two ideas how it may look reducing it's hours by 16 (to open 35 hours a week). That's a 31% cut. The red squares are just my visualisation and NOT direct proposals that WCC are putting forward. One day, hopefully very soon, Warwickshire Police will open a Twitter account and produce a Twitcam. Until then, see how the West Midlands Police and Fire are leading the field to engage with their local community. What's in Kenilworth have a YouTube channel. 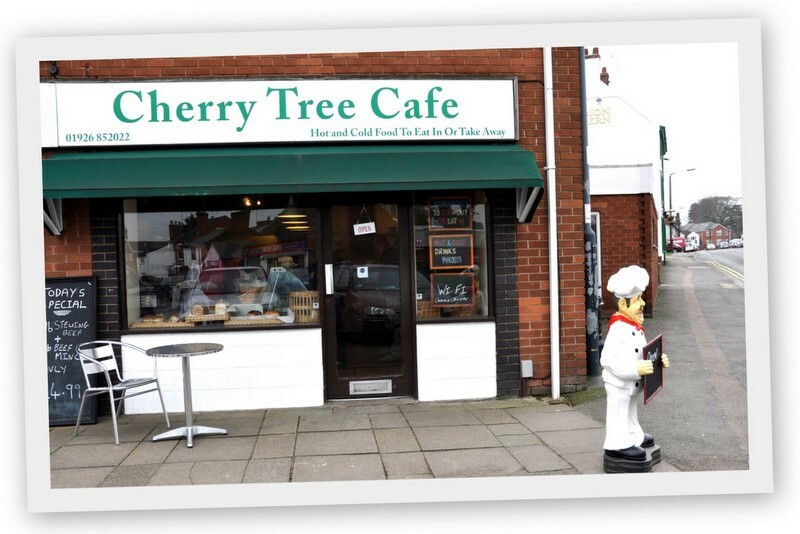 There will be a live Twitcam this evening from 7pm at Moor Street, Earlsdon, Coventry. The event is hosted by West Midlands Police Chief Inspector Kerry Blakeman and Coventry Fire Command Operations Commander Simon Shilton. I will be attending the event and anyone wishing to tune in can do so on Twitter. The live twitcam stream will appear here when the link is ready. If you are in near Earsldon Street, and Moor Street come along, watch in person and meet the team. For more about Twitcam click the TWITCAM label below. This is a live broadcast of a Coventry City Council Meeting brought to you from Coventry City Council and publici. The video will not play live in this post, but will link to the live transmission. We hope that Warwickshire County Council will soon use this method to broadcast their meetings. 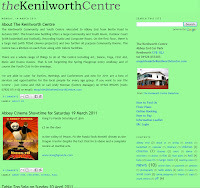 There is a new website in town from The Kenilworth Centre, also known as The Kenilworth Youth and Community Centre. They have opened a twitter account called @theKenCentre which is very forward thinking as so many people from Kenilworth are now found tweeting. On the local level, we all want to Save Our Library don't we? But, the issue is country wide. Here are three sites that give a broader picture. 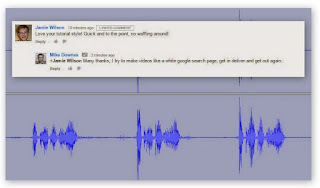 Voices for the Library, Public Libraries News and Voices for the Library Links. There are two other sites: Friends of Gloucestershire and Save Doncaster Libraries. It seems the growth industry at the moment is the Legal Challenge - any Google Search will tell you the latest. Kenilworth and Warwickshire - what should this site report? 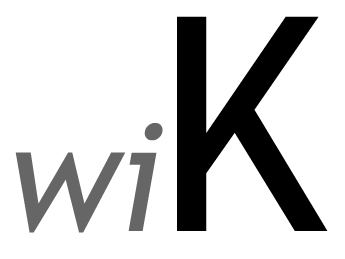 When I started wiK, 10 months 2 weeks 5 days ago (April 2010), I had no idea what would happen and how much interest it would create. I hadn't heard of Hyperlocal or Citizen Journalist - but I do now and so it seems does everyone else. I've met with the BBC in Coventry and now in a few weeks it will be the BBC in Birmingham (I am not allowed to talk about that at this stage). In this short post, all I want to say is I started this site about Kenilworth, but as you have read, it has spread to many Warwickshire issues. I have started whatsinWarwick.com and have plans for other Warwickshire Towns. But for now, I am mindful that the County is suffering and local news papers (you know who you are) are not asking the right questions and not sending the reporters to cover the events that matter. I'm also amazed at how slow other news organisations are - they are suffering too. As someone said to me a few weeks ago, What I like about your site is that it's informative and not about you. - I will take that as a compliment. The Warwickshire Libraries Consultation - What are the Questions? Following on from the post of 17 March where I outlined the consultation document, here are the questions that are contained in the questionnaire. You can judge for yourselves if they are trivial, meaningful or essential. If you have ever filled in something like this, you will notice some open, closed or multiple choice questions. I understand this questionnaire to have been written in conjunction with the Consultation Institute. To complete the form yourself, go to a library, view and print or complete the online version (this is the Warwickshire Library page with a link to Survey Monkey). 1. What is the main way you are involved with Warwickshire libraries? 2. Which libraries (or mobile) do you currently use? 5. Which of the following statements best describe the impact you feel the proposed changes to the library service will have on you / your organisation? 8. Would you be interested in having a library service occupy space in your premises? 9. Would you be interested in moving your business / service into an existing library building? 11. Are you interested in volunteering to run / help to run an alternative library service or maintain current opening hours? 12. If Yes, how many hours per week might you be prepared to work? This would be subject to discussions about roles, rotas, holiday cover etc. 13. Would you be interested in supporting activities and events? 14. Would you be willing to volunteer to provide support on a mobile library? 15. If Yes, how many hours per week might you be prepared to work? This would be subject to discussions re: roles, rotas, holiday cover etc. 18. Which category best describes your position within this consultation? 19. What is your gender? 20. Which age category are you in? 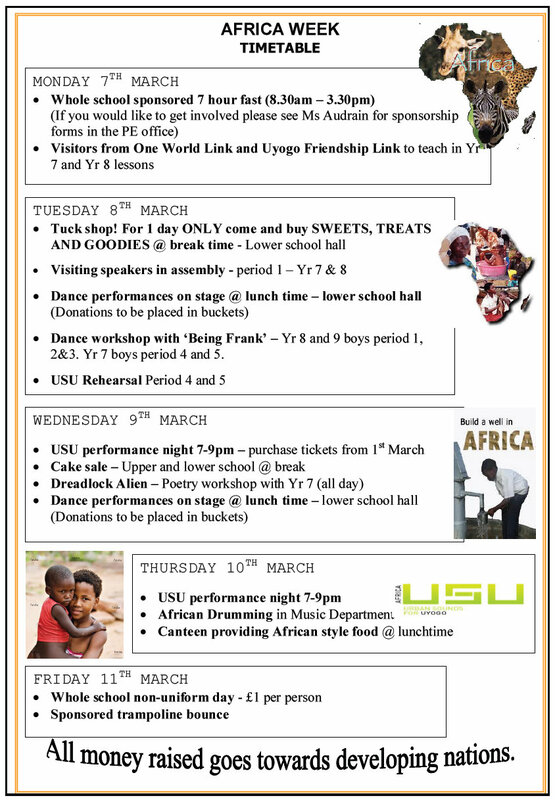 Read the full Newsletter From Mr Abbott: Africa Week went very well and by the end of the week we raised in excess of £6,200 which will go to Uyogo. I would like to take this opportunity to thank everyone who was involved in making it such a success; students who organised the event, those who participated either in the performances on stage or by giving technical support back stage, the staff who supported them and all of the volunteers who were involved. There is clearly much talent amongst our students in school and in the local community. It was a packed WCC Committee Room today with 60 people at 1.45pm awaiting the outcome of a Cabinet to discuss and approve Warwickshire Library and Information Service - Facing the Challenge to the Public Consultation -Tell Us What You Think. This phase, which starts today, lasts 12 weeks and ends on 9 June 2011. The Consultation booklet is eight pages (two page information, six pages questionnaire). although it asks general questions, it does not outline any detail on hearing from people who are part of a local group who would be interested in running an alternative service. So, to get started, there is a meeting at 7pm today for Save Dunchurch Library. I will be compiling a list of all Warwickshire Libraries with links, meetings and press releases over the next few days to coordinate all groups and share knowledge. Highlighted Name = Threat of Closure. Links will be added as soon as they are available. If you know something or have a suggestion - email of leave a comment. wiK attended this meeting. Infant school hall was packed with 150 people. Slideshow presentation by Robin Aird outlining facts from WCC data. Audience invited questions and ideas to keep the Library open. This was the first Dunchurch meeting. Suggestion that Meeting 2 has rep from WCC to assist consultation process. From the Residents: This week sees a significant event in our continued campaign to save Bulkington Library from closure.Thursday 17th March the Cabinet meets to discuss proposals to review the Library services currently provided in Warwickshire. A group of Bulkington residents, County Councillor John Ross and Member of Parliament Mr Mark Pawsey are meeting at 1.30pm at Shire Hall Warwick to present a petition to keep the Library open (currently 3095 signatures with more to collect) to the County Councillor Leader Alan Farnell. Bulkington has been identified on a list of sixteen libraries as being unsustainable. 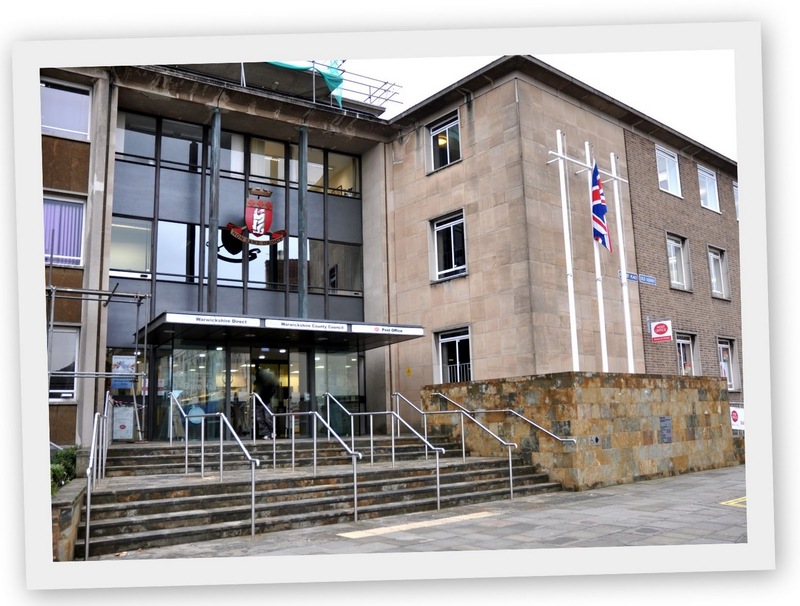 The County Council intend to carry out a consultation process that will allow people to put forward their views and opinions on future library provision. The people of Bulkington and surrounding villagers have already expressed their concerns and firmly believe that Bulkington Library should not be considered for closure. We have been advised the first date for consultation on the review of Library services will be held the following week. When we get confirmation of the date we will announce through the press and notices will be posted at the Library, around Bulkington and surrounding villages. The Jams are Back in De Montford Road - get them now! This week's Newsletter in full. From Mr Abbott: This year, once again we are celebrating Africa Week in school, which embraces a range of events including sponsored events, visiting speakers, poetry readings, music and dance performances. The concerts and swing night showcase some excellent performances from many of our talented pupils. We are grateful to everyone who has helped and organised the events and to the Mayor and Twinning Association, in addition to other visiting speakers for helping to raise the profile of this important event in school and for making it the success that it has been. It is always worth remembering the purpose of Africa week, as we have been celebrating it every year for the last seven years at around this time. It is a largest fundraising event for charity that we organise in the year and all money raised during the week goes to support underprivileged children in Uyogo, as many of them are deprived of the basics such as clean water, electricity, fresh produce and their local school provides only very basic facilities and little opportunity for young people to achieve success and eventually leave their community for a better life style. It is always a wakeup call to us in the modern industrialised world to remember how privileged we are in this country to have the opportunities that we have and these should never been taken for granted. Around the County in 34 Libraries - Gathering Income, but not enough? Take a whole load of public money, divide it by 34 Warwickshire Libraries (equally or unequally - it doesn't really matter), call it a budget. See what happens...realise it's not enough and review the lot (knowing the budget is so much smaller). So, that's where we are nearly now. Another way is to forget about the budget (Yes OK, not totally) and just increase the income - so what services does a library charge for? Facilities, Borrowing Entitlements, Fines and Charges outlines everything from 5p to £20.00 for overdue books to Orchestral Sets. On the left, is a table showing how Rugby Library receives £110,392 a year as income down to Camp Hill having a zero income. It is worth pointing out that some (or maybe all) of ICT computer income is not included in this figures. Again, I will investigate this further. My main question - is this the full picture or not? Community groups will need to know exactly what is happening in their local library when (and if) they complete a consultation proposal (from 17 March 2011). So, what does the bar graph below tell us? We have the yellow highlights showing the libraries which are proposed for closure. Wolston has little income - but is saved. Yet, Bidford and Bulkington have a reasonable income, but face closure. That was the partnership joint services argument. The top four: Rugby, Leamington, Stratford upon Avon, Nuneaton and Warwick make 63% of the income. This could be described as the power law or long tail where large quantities are gained by the few. And that's where the whole picture versus case by case starts all over again. Should Rugby and the others help the smaller libraries - of course they should. But how? Get it Loud in Libraries has already started at Rugby Library where Live Music has been performed. Tickets were sold out. Leamington would be a great venue for live music complete with balcony over looking the band. Later posts will discuss business proposals. Here are some more charts. These three are gathered from WCC Library Trend Data PC Bookings have been dropping over the last three years? A change to the booking system, users having their own PC at home or is it a cost issue? No idea, but will find out, emailing now. Remember, WiFi has only been available at Warwick and Coleshill until the last few months. Note to readers: The issue of Libaray Closures and Cuts will become quite large when the Consultation starts on 17 March 2011. For all those readers who contacted me asking to find out about Public Council Meetings - here is the list compiled by Warwickshire County Council (and prepared by wiK). Read Eric Pickles Citizen journalists and bloggers should be let in to public council meetings which includes a brief history of how the press and the public were first allowed into these meeting when Margaret Thatcher changed the law 50 years ago. So, what are we looking for? In my view two ways: All Libraries versus My Local Library (local meaning not just Kenilworth, but the library in your tow or village). Agenda and Behind The Scenes Venue: Park Hill Primary School, Parkfield Drive, CV8 2JJ The Community Forums give YOU the opportunity to raise issues of local concern and keep up to date with what is happening in YOUR community. 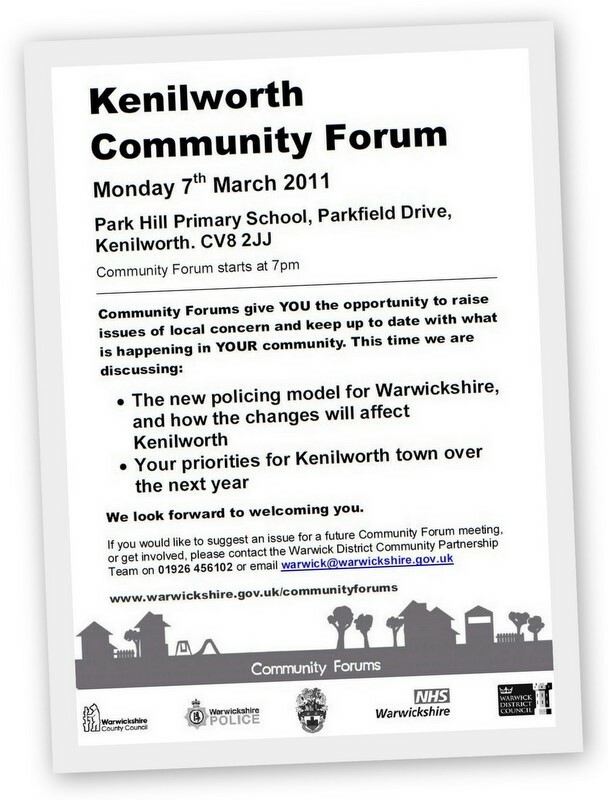 This time we are discussing: The New Policing Model for Warwickshire and how the changes will affect Kenilworth, Your Priorities for Kenilworth town over the next year. We look forward to welcoming you. 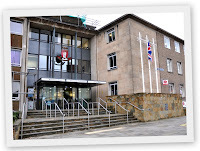 On the 1 March 2011, I attended the Communities Overview and Scrutiny Committee in Committee Room 2, Shire Hall, Warwick. This was a public meeting . There were 18 people in the room: County Councillors, some employees and me. But, not one member of the public. Was the meeting not publicised enough or perhaps people were at work or busy at it was a weekday Tuesday morning? When the troops marched through Kenilworth last August – the streets were full. When The Queen was in Leamington earlier today – the streets were full. So, why do people not go to Council meetings? Yes I know, the draw is not the same – but not even one person? I was later told it was not a decision making meeting. Maybe, the simple fact is having no interest in an event like this. The reason I went along was to find out about our County and report back like this – but more than that, it was to see how a Council meeting works, what councillors say, how they look and more importantly – how they think and form opinions. From the initial glances (not from everyone), I felt like I was the imposing on a private space and shouldn’t be there. Let me say, it can be intimidating, but the clerks were very welcoming and helpful. I’m going to paint a picture, not list names of who said what, but just look at my notes and join the dots. So the first thing is there is lots of seat swopping and people coming and going as the topic changes. From the photo on the right, you can see the room has a top table seating up seven. Nine Councillors sat in the first area with another four plus me at the back. Prior to the meeting, an Agenda document (some 30, A4 pages) and further detailed documents are available – so there is a running order. This meeting started the opportunity for the public to speak for up to 30 minutes…of course there weren’t any. Next, a report back from the High Speed 2 consultation launch that took place the day before. After that, (and missing a few things out) came some questions to the Portfolio Holders about a police report. Usual comments like the Public’s perception to the Police. How funding has been lost, investing in People not Buildings, shift changes, reduction in paperwork and the new Mobile Data Terminal. This was the item that I was really interested in. WCC are considering closing 16 out of 34 libraries and will present to Cabinet on 17 March 2011. The discussion starts with talk of £1million here and another £1m on management services and network. Costs of staffing and premises, closure and the odd village hall mentioned. While all of this was going on – it occurred to most of the councillors that the detailed document had not been copied (or councillors had not read and printed it from the web before the meeting), so the debate was going on without any data facts. Eventually, enough copies arrived and it seemed I was the only one who was not given a copy (yes I know I had one tucked away on my netbook). So the declaration: We are Open Minded on Working with Anyone. The people get the books and the buildings – there is potential. What potential? Oh, the chance for the People to make a business plan (great ideas plus a financial proposal) and submit it to the WCC – case by case for consideration. It seems customers accessing libraries is falling – you know lots of digital access and ebooks these days. The CC will be holding local initiatives meetings and offering constructive advice (this will all be post 17 March). The cynic in me may say – hold on a moment, does this sound like the WCC have lost £2m and they are asking the people to think creatively to bail them out and if they can’t, they we’ll sell most of it? But the patience in me knows these are just ideas and creative thoughts to solve a problem. Enter the cost sharing idea. Seems each library has different departments within it i.e. library, Warwickshire Direct and other services (more on this later). Then comes the talk of rejigging mobile library routes, maybe Mon to Fri only, talk of bigger vehicles, demand analysis and time spent per location like 10 mins versus half a day. Then the meeting is told how the people will be provided with a template to complete if they have some robust ideas to save their local library. Buzz words here are: Viable Sustainable Solutions which will not equal a library closing, local service agreement , whatever that means - something to do with sharing? How was the list compiled, where did you get the 16 libraries earmarked for closure? We looked at which libraries are stand alone i.e. they offer a single service (like being a library and nothing else). So if a library offers: library and Police, then it’s not on the closure list? Yep (just like Bulkington to close, see Nuneaton News and Wolston stays open). Buzz word concept – cost sharing partnership. Paying staff to work in a library costs the most money. Take the staff out, put in automated machine, then maybe hours can be extended? Correct – less staff, more machines. From the public’s point of view are they really expected to know the difference between Warwickshire District versus Warwickshire County and Warwickshire Direct? I think not. But, the more people who are within the council seem to know the difference between WCC and WDC, Shire Hall versus Riverside House. In my view, the people see a pothole and want it fixed, not stutter to report it as they wrestle with the County versus District Issue (potholes are County by the way). Let’s play a game called: The opening hours go down and the saving go…Up! No, it’s not a Brucey Saturday Night, it’s the serious business of evaluating case by case what happens with libraries that stay open, but have to lose 16 or so hours a week. What does Mix n Match make…value4money! Pulling in the options, everyone is reminded that this process is a genuine consultation with no predetermined solutions. No plans are to go ahead. The councillors are expected to work with the community. Buzz word: transparent information, mindful of costs, for a community to almost guarantee a solution. Cynic once more may say…wait we didn’t lose that £2m – why is it us who has to be become a rainmaker and bail you out? The reply comes back: we are giving the communities’ time to collate all the ideas and provide a longer time before the 14 July cabinet meeting and then action the changes from October 2011. Thank goodness its lunch - half an hour later, we are back. A few phrases are bandied about like: hubs, locals, spokes and understanding customer needs. I could almost hear someone say, it’s not what the community could do for your library - but what the library could do for your community. But, no one said it. On a fractions note, it appears the reason people go to the library is for a third of the time for information and two thirds for books. More comments like: this is an opportunity to remodel the library service, especially with the advent of electronic services and the eBook. And visions like this continued with examples of the library as a convenience to meet, to discuss and form a reading group, a coming together and meeting the needs of the vulnerable. It appears, the lowest location visitor numbers are at the places where libraries are needed the most. Alarming fact. Then the question came, is the cost driven review the correct approach? Answer seemed to be SAVINGS first, OPPORTUNITIES second. Finally, live music in libraries was mentioned not with out the hesitant comment of, can you allow Gig and Library in the same sentence? You better –it’s 2011. Inspirational words came in next in the shape of pull together, forward facing provision, maybe name it a Community Hub. Someone else mentions children doing their homework and how 50 kids may turn up to Rhyme time. It’s back to eBooks again with a few points about raising revenue by charging for them and how the online payment system at WCC is very unfriendly. Remember, I cannot raise my hand to say anything. The whole one eBook loan at a time is awful, but it’s linked with copyright and commercial restrictions. I could not say anything – especially about the recent Harper Collins issue that eBooks license may expire after 26 loans. What seemed to be valuable was a comment made to say: this was a time for the mood and appetite for change…although uncomfortable – let’s see this through and change. How about working with commercial companies like Starbucks? Answer came back: if a big picture issue, then it may change the service, but on an individual case by case – it may work. Interesting that view was one that when a commercial company trades in a library – it’s no longer a library, focus or service changes. Apparently, Rugby has some vending machines. WCC/WDC want to ask What have we missed? Loads, I’m betting. The group were then told many emails have been coming in suggesting many options and ideas like Sainsbury sponsoring Dunchurch library (somehow). No list was available though (that I saw). Bottom line, get given a blank sheet of paper or take a template and fill it in with lashings of creativity but a large weighting on packing and setting the slide rule correctly (the financials must make sense) and who knows – we could all be proud library owners come October. If you have views on any content in this post, leave a comment. It’s written as a narrative – not a reference report, but if my note book is correct then let it act as evidence. The next public meeting for this issue is 17 March 2011 at Shire Hall, Warwick – please come along, I’m lonely at the back on my own. The deadline for applications to Castle Sixth Form was on the Friday of the week before half term. I am pleased to say that we have received a large number of applications from students both in year 11 at Kenilworth and from other schools. The interview process is due to begin next week and will last for the next three weeks. This year we have 6 students in the Sixth Form who have conditional offers from Oxbridge. We also have a larger number of students than ever before who have gained offers from their first choice university. Following on from the Friday Club support which has been offered to year 11 students for the last two years, an equivalent study support opportunity has been provided for sixth formers. I hope that students will take advantage of the additional support that is available to them from individual teachers or departments in the run up to the public exams next term. @Coventry_Police (Insp Alastair Orencas) Two Twitcam Broadcasts (one archived). @kerryblakeman (CI Kerry Blakeman) Two Twitcam Broadcasts (one archived with Simon Shilton Operations Commander West Midlands Fire Service). @ErdingtonLDG (Police, Fire and many other groups) Two Twitcam Broadcasts (@wills_5590 and @Neil_Grif WMFS Both Archived ). The next Twitcam (from Police and Fire) will be on 22 March with @kerryblakeman and @spshilton. However, there are plans for a special Twitcam from Warwick Library on 17 March 2011 with @808Kate, @Kaz_Ram and @wiKenilworth when the next Warwickshire SMS takes place. This is an event when anyone can learn how to improve their social media, blogging or web skills (for free) - why not come along? This Joint Agency Twitcam is now over, but is now available to watch again. This shows how something as simple as live video feed can show how Police, Fire and other agencies can successfully engage with the community via social media. To my knowledge, Warwickshire has not broadcast any Twitcam at all so far. But thankfully, I have contacts in these area and will be doing my best encourage them. This shop has been open for about two weeks (as 3 March 2011). 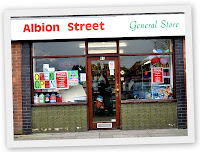 This shop is linked with Kenilworth News in Bridge Street. It is good to see these premises occupied again. A blogger has been studying the contents of three apparently separate local newspaper titles and found that they are virtually the same once you open them up. Aside from the differing front pages of the Kenilworth Weekly News, the Leamington Spa Courier and the Warwick Courier, there are very few unique pages inside. By the calculations of the blogger, WhatsinKenilworth, they share almost of all their 76 pages, which he/she thinks is "pretty poor", and asks whether the publisher, Johnston Press, is trying to pull a fast one. I shouldn't think so. It's all about reduced resources, and it has been fairly common practice for many weeklies with "sister publications" for some time. For the record, the Kenilworth paper sold an average of just 3,120 copies in the final six months of last year (down 11.7% on the same period the previous year). The Leamington Courier's 11,012 sale was down 9.5%. And the Warwick Courier? 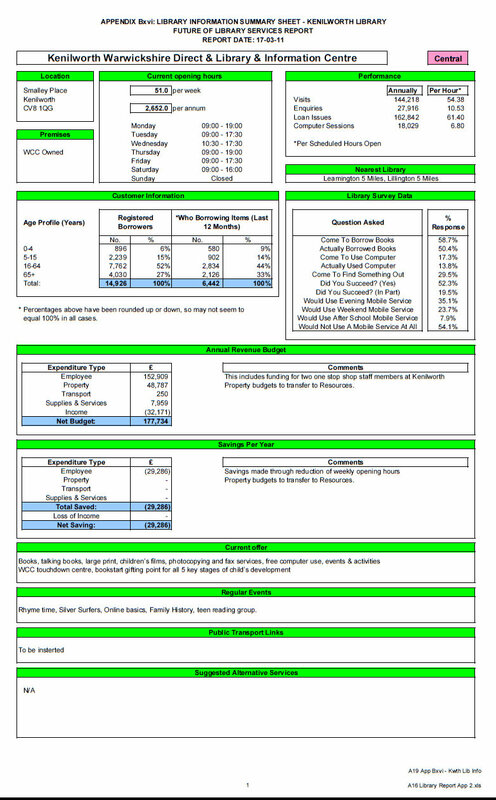 It is not separately listed in the ABC statistics.